Two Honors seniors, Noelle Rowe ( Falk ’19) and Corbin Simenz (AS ’19) were among the 13 McNair Scholars who presented their research at the 2018 Summer Research Symposium on August 9 and 10, 2018. The presentations were the culmination of a 6-week long McNair Summer Academy, which prepares scholars admitted into the McNair Program to become future scholars in their respective fields. Rowe is a senior pursuing a major in Human Development and Family Science in the David B. Falk College of Sport and Human Dynamics and a minor in Psychology and Education. Her research titled, “Who am I? 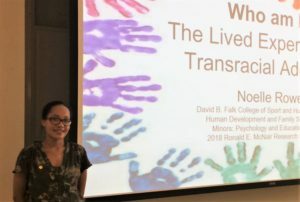 Lived Experiences of Transracial Adoptees”, examines “the racial identity development of black individuals domestically adopted by white parents by focusing on how family relationships, social relationships, and racial socialization strategies impact the identity development of adoptees.” Her research has the potential of shedding light on the controversies surrounding transracial adoptions. Simenz is a senior in the College of Arts and Sciences with triple majors in Latino-Latin American Studies, Political Science and History. 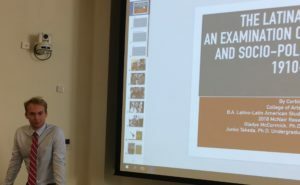 His research titled, “The Latina Guerilla: An Examination of Violence, Space and Socio-Political Economy, 1910 – 1985”, focuses on the role of Latina women in South America’s revolutionary movements. The McNair Scholars Program at Syracuse University is a federally funded TRIO program that prepares high achieving undergraduate students for graduate/doctoral studies with hands-on research, academic services and financial support. The program is designed to provide motivation, encouragement, and support to students from all disciplines. To be admitted into the program, applicants must meet the eligibility requirements outlined on the program website. Scholars receive mentorship and guidance in preparing for graduate school through the Summer Academy. The McNair Summer Academy has four distinct initiatives: Research Experience, Summer Workshops, Graduate School Series and Community Scholarly Activities. These initiatives are designed to help the scholars to successfully navigate the GRE, research, as well as the other key aspects of graduate school preparation. For the research experience initiative, scholars enroll in a 3-credit research methodology seminar where they engage with the fundamental elements of research in their fields. Subsequently, they develop a research concept on an issue/topic of their interest, which they present to their peers and mentors at the Research Symposium to demonstrate the skills that they have gained. For more information about the McNair Scholars Program, contact the Director, Christabel Sheldon (coseibo@syr.edu).